← News from the toyshop! Apologies for this afternoons broken link, this one works…! With the festive season out of the way, the trade fairs are in full swing. January seems to be when it all happens in the toy world. We spent yesterday hot footing it around Top Drawer in Earls Court, on the look out for new and exciting products. There is always so much to look at, that it’s tempting to stop and look at everything. We were on a tight timetable though and got round in just under 5 hours, then a quick dash back on the train in time to collect the kids. I needed that cuppa by the time we got back I can tell you! One of the best parts of the day for me is always that moment when I spot something that makes my heart beat faster, makes me laugh or is just so innovative or cleverly done that I just have to have it. 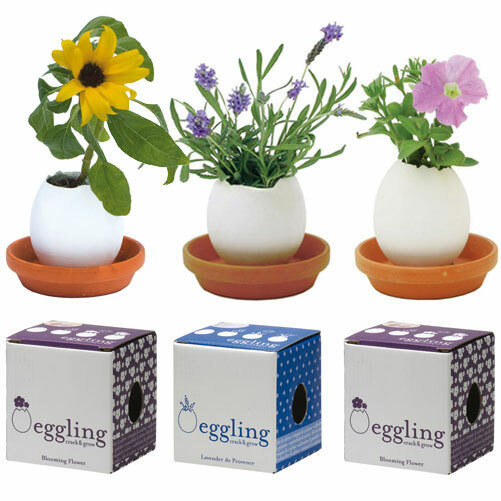 We revisited some old favorites like the company “Noted” who supply us with the lovely Egglings, (little ceramic eggs that you crack open and sew with the seeds included). There are some additions to the range, so as well as last years best seller, the Basil and Wild Strawberry, we will be adding Petunia, Mint and Lavender, these should come in early next week, so keep an eye open, they sell so fast I will be keeping a few back to give as presents! Amongst our other discoveries yesterday was a super set of illustrated cards, packaged in a kit with electric paint from Bare Conductive. The company makes kits and hardware that make it easy and fun for anyone to get in to electronics. The paint conducts electricity and you use it to “draw” circuits with the paint pen on to the cards. These completed circuits then make the lights flash on and off, at £14.99 it’s a great gift product for 7+ with supervision and 12+ unsupervised. check them out at http://www.bareconductive.com. Watch out for these, and some great new card lines coming in in the next month or so. Next week is Toy Fair at Olympia, so I will be finding my comfiest shoes for two days of walking the aisles. I’m keen to revisit some favorites, I see Meccano have a stand, there is the relaunch of the Tamagotchi and some great new magnetic construction kits I would like to see. The most exciting visit of the fair though has to be the Lego stand. It’s a closed space so you can only enter by appointment, and you have to be a Lego retailer. We get a sneak preview of the new launches for the year, sorry though, I’m sworn to secrecy so I can’t say more! In other news; we are keenly awaiting next weeks arrival of the new range of Lottie Dolls. The Chelsea based company Arklu have won numerous prestigious industry and consumer awards this year. There has been plenty of coverage in the national press as well, so you may have read about her success. It’s refreshing to find something new, and Lottie really fills a gap in the market, I just can’t believe it’s taken so long. The proportions of the doll are based on those of an average 8/9 year old girl, so, no breasts or hips, just a strong, small girls physique that girls can identify with. Why do I love her? Well, there is no make up, no high heels and no jewellery, she is just a little girl doing the things girls do. She isn’t physically distorted like Barbie and her awful stripper-gram wardrobe, and she isn’t a baby either. Lottie is a Pirate Queen, a Scientist, a Footballer, she rides a horse, walks her dog, does Ballet and Taikwando, and yes, she has some pretty dresses too. It’s been interesting to watch our own children engage with the dolls, there have been some carboot Barbies kicking around for a long time, but short of brushing their hair they aren’t played with. Lottie on the other hand has been a huge hit, our son loves horse riding Lottie and her Welsh pony, and our daughter is torn between Autumn Leaves (duffel coat, stripe tights and wellies), Country Garden (summer dress and socks) and Snow Queen, the most girly looking of the dolls with her big dress and petticoat. They have all had an outfit change and now wear a petticoat with wellies and a t shirt, a summer dress and duffel coat etc. They spend ages playing and creating worlds and scenarios for her which is really lovely to see. Finally, we will be holding a window competition next month. Once the categories and rules a finalised, I will post the entry forms and information on Facebook for you. There will be a grown ups category as well, I know how many creative customers we have and I wouldn’t want you to feel left out!